This past weekend a tragic thing happened; 36 year old DJ AM, Adam Goldstein, passed away. He was found dead in his apartment in New York. DJ AM was a talented figure in the world of music and will be missed by many. Almost exactly a year ago, on September 19, 2008, DJ AM survived an intense plane crash that killed four other people. During his many years of spinning records he always wore a Rolex and on that fateful day he had a vintage Rolex on. 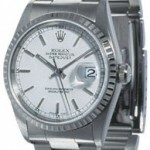 Pictures of the burned Rolex surfaced on the Internet, some thought DJ AM was making a statement that he no longer wanted to wear Rolex watches of which he had become a fan. But that wasn’t the case; what he was trying to do, was show the public how bad the crash had been and if anything, this was a major testament to the durability of Rolex watches. Less than a month after the plane crash, on October 16, 2008, DJ AM gave a “comeback” performance at the Hollywood Palladium. He was miraculously back on stage, spinning records and seen wearing a Rolex Datejust. Although during the time of the crash DJ AM had broken up with then girlfriend Mandy Moore, it was rumored that she had given him this new Datejust to replace the vintage one that was ruined. As we now mourn the passing of another young, talented life gone too quickly, a DJ AM Memorial Tribute Round Italian Charm watch that features a picture of him, is already circulating around the Internet. In addition to collecting Rolex watches, DJ AM was a serious fan of Nike sneakers. He had over 600 pairs, including a pair of Nike Air Force 1 shoes that were created just for him and which featured his DJ AM logo on the shoe. Perhaps both Rolex and Nike should make a luxury watch and special pair of sneakers to honor the life of this young man, who had overcome so many personal obstacles.